Eloisa is All Over New York City This Week! We’re thrilled that Eloisa was featured by Good Housekeeping as one of 10 Women Who Light Up the Arts Scene! Check out the fabulous makeup done by L’Oreal! 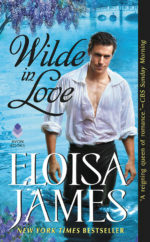 Would you like to win a fantastic basket with signed books and goodies from Eloisa’s stay in London? Eloisa is taking part in March(ing) Madness to help support her friend, Emily March, in raising funds for Cystic Fibrosis research and awareness. Please visit the donation page for details on how to donate and win Eloisa’s basket! Entertainment Weekly Loves Eloisa’s New Cover!